GAINESVILLE, Fla. (AP) Florida guard Chris Chiozza hears about ”The Shot” almost daily. Friends, family members, teammates, classmates and social media sites provide constant reminders of Chiozza’s running 3-pointer at the buzzer in overtime that stunned Wisconsin in the NCAA Tournament and sent the Gators to the Elite Eight. Chiozza gets an earful from coach Mike White all the time, too. The Gators have a chance to be special this season. 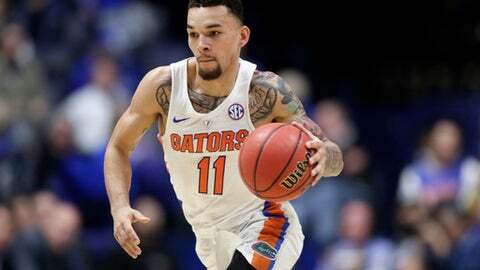 With Chiozza and shooting guard KeVaughn Allen back, and transfers Jalen Hudson and Egor Koulechov in the mix, Florida is a popular preseason pick to make another deep run in the NCAA Tournament. Players and coaches are embracing the lofty expectations , too. ”I think it’s good for our fans, it’s good for recruiting, just adds a little bit more excitement around a program,” White said. ”I just don’t think it’s got a big bearing on how we play. We’re going to practice to a certain standard every day. We’ve got high-character guys. They want to be as good as they possibly can be as players and as a team. The Gators finished 27-9 in White’s second season, with the biggest of those wins coming on Chiozza’s buzzer-beater against the Badgers at Madison Square Garden. Florida’s season ended two nights later with a 77-70 loss to South Carolina. Nonetheless, the run provided some measure of validation for White and a program that expects to be NCAA Tournament regulars and perennial Southeastern Conference contenders. Even though Florida lost a lot – Kasey Hill, Devin Robinson, Justin Leon and Canyon Barry are gone – and center John Egbunu (knee) is out until January, White added two transfers and a freshman class that ranked 11th in the country. Hudson (Virginia Tech) and Koulechov (Rice) are the most important newcomers. The 6-foot-6 Hudson averaged 8.4 points a game as a sophomore with the Hokies. He sat out last year because of NCAA transfer rules and looked like Florida’s best scorer at times in practice. He’s likely to come off the bench, partly because of Koulechov. The 6-5 graduate transfer averaged 18.2 points a game as a junior at Rice last season and shot 47 percent from 3-point range. He made at least 80 3-pointers in each of the last two seasons and is expected to give Florida its best outside threat since Michael Frazier (2012-15). SCHEDULE HIGHLIGHTS: The Gators open the season Nov. 13 against Gardner-Webb and should get a decent gauge of where they’re at in the Phil Knight Invitational a week later. The tournament includes Stanford, Ohio State, Gonzaga, Duke and Butler. FRESH FOUR: Guard Mike Okauru and forwards Chase Johnson, Isaiah Stokes and Dontay Bassett make up Florida’s freshman class, and a couple of them could be key contributors. Okauru will get minutes as Chiozza’s backup, and Johnson and Bassett should get some minutes, too, especially with Egbunu sidelined. Stokes, though, could sit out the entire season while recovering from a knee injury.